There’s no more dramatic entrance in professional football than the one put up by the city of Hamilton. To see the Tiger-Cats at home, fans from Western New York travel up the Queen Elizabeth Way to Nicola Tesla Boulevard just before the bridge. That road goes through a large industrial area that features a smell that is, um, appropriate for the businesses that have homes there. Hamilton makes more steel than any other Canadian city. A look to the north from the elevated roadway reveals factories that stretch to the bay. But football fans soon turn south on this day. They take a left on Gage Ave., and drive toward the lights of Tim Hortons Field several blocks away. Most of the big parking lots are sold out in advance, but there are those who will be happy to guide you into a space in front of a business or house that is barely big enough to fit a car. This isn’t New Era Field in Orchard Park, which is surrounded by parking lots. This is a neighborhood is filled with old-style houses that don’t have driveways or garages. It’s downright cozy. Put it this way – it’s almost like pulling into the area around War Memorial Stadium in Buffalo in the early 1960s to see the Bills. Or, if you prefer, it’s as if a good-sized football stadium had been dropped into a neighborhood in Lackawanna near the steel mills in the Forties. The scene just screams out Blue Collar Football. Leather helmets would be appropriate. That was what was on tap late Saturday afternoon when the Tiger-Cats hosted the Calgary Stampeders – even if the game did turn out to be high-scoring and filled with big plays instead of featuring classic smashmouth football. Fans can get very close to the action when they sit in the end zone. I hadn’t been to a CFL game in 39 years. Back in 1979, top draft pick Tom Cousineau had rejected the Bills’ contract offers to play for the Alouettes in the CFL as a rookie. Two friends of mine and I decided to let our feelings known about that one. We headed up to a game in Hamilton, and booed Cousineau whenever his name was on the public address system. I guess we showed him, although the Tiger-Cats fans had a little trouble with the concept of someone driving 65 miles to boo someone. I was curious what it was like now. Traveling companion Matt had never seen a CFL game and agreed to ride shotgun. That ’79 game was rather dull. This one was hardly that. It was a matchup between the two leaders in the respective divisions, as Calgary was 9-2 and Hamilton was 6-5. In other words, it was a possible Grey Cup preview. That made it a little surprising that the stadium seemed a little more than half-full, and it holds about 24,000. But the fans in attendance showed their loyalty with their enthusiasm and their Tiger-Cats apparel of all types. The game started out badly for the Stampeders, as Hamilton ran an interception back 60 yards for a touchdown. Two field goals later and the Tiger-Cats had a lead of 13-0 early in the second quarter. A Calgary touchdown was answered by a 104-yard kickoff return for a score for Hamilton. But a Tiger-Cats’ fumble later in the first half turned into a Calgary score. The Stamps went on to lead, 20-19, at halftime. You want big plays? In the second half, Calgary scooped up a loose ball and ran for a score. The Tiger-Cats answered with an 83-yard punt return. The Stampeders answered that with a 99-yard touchdown pass. Trailing by 34-25 after three periods, Hamilton looked done – and was. The Stampeders didn’t allow the Tiger-Cats to score a touchdown on offense all day, and came away with its 14th straight win against Hamilton. Calgary moved only six away from tying the Dolphins’ streak over the Bills in the Seventies. 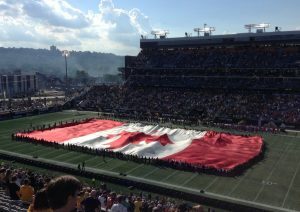 Canadian football games feature giant flags, just like the American version. Local football fans might have heard of Ivor Wynne Stadium, the former home of the Tiger-Cats. It was built to host some of the 1930 Commonwealth Games. After a 1971 rebuilding project, the facility was named after Ivor Wynne, the head of the city parks department. It had been the Civic Stadium before that. By the way, the Bills once played an exhibition game with the Tiger-Cats there in 1961. It’s the only time an NFL and CFL team have ever met; the Bills lost, 38-21. 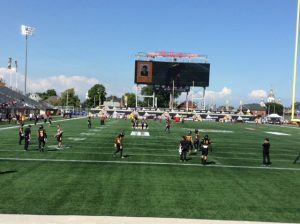 A new stadium went up on the same spot in 2014; the Tiger-Cats played the 2013 season in a college stadium while they waited for it to be completed. Capacity dropped to about 24,000, although it can hold 40,000 for special events like concerts. There was a lot of concrete involved in construction; it looks as if it could survive a small nuclear blast. One grandstand simply has an upper and lower level. The other side is bigger, since it holds suites, club seating and the press box. You won’t find a steeper grandstand anywhere, but the views of the field and of the surrounding area are excellent. Hamilton’s geography makes sense when viewed upstairs, since you can see the factory area, waterfront and downtown areas all at once. There is virtually no end zone seating. There are patio-like areas with a handful of seats to watch the action up close. It was sort of like the Dallas Cowboys’ stadium in that sense, but much smaller. You’ll be interested to know that the CFL doesn’t take a back seat to the NFL when it comes to concession prices. A bag of popcorn was $8.50, and a standard bottle of Coke was $5.25. Both are in Canadian dollars. I didn’t have the heart to look at beer prices. By the way, fans had plenty to do right after the game. They could tour the Canadian Football Hall of Fame, which is located in the club level of the grandstand, or they could walk on the field for 20 minutes and toss a football around. * Football has been played in Hamilton since 1869 – the same year that Princeton played Rutgers in the first-ever college football game in the United States. The Tigers and Wildcats merged to form the Tiger-Cats in 1950. * We bought the cheapest tickets in the building, more or less, and they were less than $40 Canadian each – even when the usual ticket fee surcharge was added. That struck us as a fair deal. 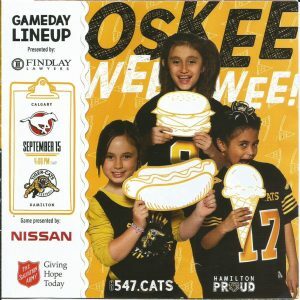 * Full credit goes to the Tiger-Cats marketing department for the way they involved ticket buyers. We received an email right after our purchase that included a game scouting report, stadium information, a parking update, promotions, directions, etc. The day of the game brought a video in the email box with a message from a Hamilton player asking for support. Then after the game, another email thanked us for attending and offered us a bargain rate for the next home game. Someone is trying hard to build up the fan base. * We had heard of only one player on either team, as Luke Tasker – Steve’s son – played for Hamilton. Luke came through with a game-high six catches for 60 yards. He also seemed to be one of the most popular players on the team, based on the number of people in the stands who were wearing his uniform. Meanwhile, former NFL coach and former Bills’ assistant Jerry Glanville is Hamilton’s defensive coordinator. * The CFL adopted a rule in which a team that gives up a field goal simply receives the ball on its own 35-yard line. If the NFL is looking for ways to cut down on injuries on kickoffs, this seems like one way to go. * Both teams’ benches were on the same side of the field. Haven’t seen that since the Minnesota Vikings playing at Metropolitan Stadium in Bloomington – an area which is now a shopping mall. * We saw a punt returner get taken down when an opposing player grabbed on to one of his dreadlocks. Ouch. * The parting gifts from the team were great. The Tiger-Cats handed out some drawstring bags that featured the likeness of the team Mascot, Stripes. Naturally, we grabbed one. And then, on the way out, we were handed a couple of small frozen Snickers’ bars. Nothing like a candy bar to put a smile on your face even after a tough loss.